The number of deer-related accidents spikes every fall, to the point of being staggering. Deer have a mind of their own and react unexpectedly. The only thing you can control is your own reaction to seeing a deer in your path. 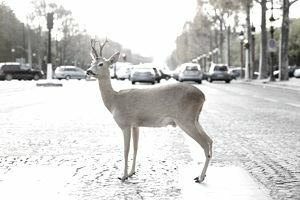 Prepare yourself for a potential deer accident and learn the answers to common questions regarding your car insurance. Never swerve to try and avoid a collision. Once you swerve, you are at a much greater risk of hitting oncoming traffic, a tree, light post, mailbox, or ditch. The damage from hitting a deer is often minimal in comparison to hitting one of these other objects. The consequences for swerving to miss a deer can be significant in regards to your car insurance policy too. Hitting an inanimate object with your vehicle is a collision. Collision accidents often come with higher deductibles and higher surcharges. Simple take your foot off the gas, brake as much as you safely can and keep a straight course. Deer accidents are covered under the comprehensive coverage of your insurance policy. If you are unsure of your coverage, locate your declarations page to verify. A quick phone call to your agent or customer service representative can also clarify what coverage you have listed on your vehicle. Sometimes after a deer accident, a tow may be required. If you have comprehensive coverage, the tow will automatically be covered as part of the claim. If you do not have comprehensive coverage but have roadside assistance, your tow will be covered. No comprehensive coverage plus no roadside assistance means you will be on your own for both the damage to your vehicle and the tow. Comprehensive coverage is often purchased with a deductible. Some companies do offer a zero deductible, so it depends on how you set your policy up. Comprehensive is less expensive than collision and is often sold with a lower deductible. If you have a deductible listed on comprehensive, it should apply to a deer-auto accident. Check your declarations page or call your agent to verify what your deductible is listed at. Unfortunately, a definite answer across the board of insurance carriers is not available. Insurance companies have varying rules on comprehensive claims. Many times, comprehensive claims do not affect your insurance rate, but it is something you have to verify with your carrier. Some insurance carriers will apply a surcharge to your policy if you have hit more than three deer in three years. Others apply a small surcharge for any deer-car insurance claim filed. Police reports are handy with any insurance claim; however, usually, they are not required for a deer claim to be paid out. It is recommended to get a police report especially if you have hit multiple deer recently. Documentation makes the claim process cut and dry. If you are able to get a report filed with the police department, get it done. Do You Have the Right Insurance Coverage to Fix Windshield Damage? Can You Believe These Car Insurance Claims?